Background: I’m Southeast Asian. I’m Thai with some mixed ethnicity like Laos and Chinese. Can’t exactly verify. May is an artist I'd admired from a distance before finally meeting in person and becoming friends. Her talent as a facilitator is evident in what she shares on the internet— whether engaging in critical discourse or promoting and validating the work of her community. "White people always want you to educate them, not realizing the answers they're asking come from years of knowledge and experience. People go to college to study these things, and yet they expect you to answer in one paragraph. It's also a game where you *have* to make it palatable to them or else everything - even if its facts - are discredited. And they judge you by if you raise your voice, it doesn't seem as true because it's 'emotional.' So POCs have the burden to explain calmly and in a palatable manner. So if they want to have this conversation, I ask them to pay me." My biggest intention in launching this series has been to promote artists of color in Portland, but I recognize that we, as a community, benefit so much from hearing their stories. I'd like to start compensating the artists we feature by supporting them monetarily. I'll first ask any readers who find value in this series to send funds directly to these artists, but as a WOC photographer, I can also use support keeping this project going. Portland in Color is looking for like-minded sponsors to keep this series going, but individual donations are greatly appreciated as well. Medium of choice: Right now I do facilitation but I have a visual arts background. Quietly I’m coming back to do art consisting of sculptures and drawings to heal some old wounds about art institutions, and for fun I’m developing a Thai food show with actual Thai diaspora people narrating our culture. But mostly I talk a lot. I listen, chew information, and lay it out. With facilitation, it took me a while to understand why I like it besides people telling me I’m good at it. I get to process emotionally while making it clear that I’m strategizing emotional labor: mirroring, validating, reflectively listening, acknowledging, and steering it with racial or gender base context. Emotional labor is labor and needs to be compensated and I’m glad people are starting to honor it. I think art is the process of discovery, like accepting chance and mistakes as information, and I see that similarly with facilitation. Art is subversive and I hope I am too. Right now my artwork is part of a larger series that explores the Southeast Asian and Thai Diaspora identity through consumerism, imported cultural productions, food packaging, displacement, immigration, and generational trauma. Tell us about one of your favorite Portland memories: One time I was talking to a Thai food cart owner and she treated me a special laarb dinner not on her menu, and we had dinner together on the picnic table outside her cart. She was like “So sour!” while I’m squeezing more lime into it. These kind of things make me think about ancestry through my palette; that’s a northern Thai and Laos palette, even though I know too little about my family’s history past some mentions outside of their survival. Every time I feed myself good food, that’s me giving to my ancestors: I am the altar. Whatever I accomplish, whatever good I make, I place it on the altar and that’s the honor I offer them, earned. Please share a time it was difficult living in Portland: The invalidation of racism from people who don’t live with racism every day. Bernie Bros who don’t want to talk about race 'til 2017. The suppression of Southeast Asian identities unless through exotification, and their isolation to get the care they need for things like mental health & PTSD. White restaurants using Cesar Chavez’s quotes out of context while mistreating their own brown employees, using hip-hop for gigs while ignoring police brutality, co-opting the word “Intersectionality,” tokens tone-policing other people of color while becoming the Diversity poster child for sham white-led equity programs. Like I remember after Trump got elected, I went to a white Progressive™ friend’s dinner party where another brown person was there. The brown person mentioned Portland racism, and white Progressive™ people talked over him with: “Oh Portland’s not THAT racist!” So I called that out, that dismissal of a POC’s lived experience, that deflection and justification for non-action that continuously allow racists to organize— especially in Oregon, a key place for white supremacist organizing. And after that they got fragile, they immediately talked to me about how they grew up in a “diverse” neighborhood… immediate microaggression. They made it about themselves and their Progressive™ self-image.. The list can go on, but yes. How do you stay inspired in Portland? I stay inspired by staying connected to people and laughing a lot. Memes are so subversive. They critique power like you wouldn’t believe and they do it in such a witty and sometimes, pathetic way. I’m kind of a weird fan of pathetic. Community means a lot. Just be able to do work on your laptop with a fellow person of color, karaoking, going to events like First Thursdays and feeling relieved that you encounter a person of color you know. Ultimately I’m just inspired by people of color who are doing a lot of cultural work in Portland. How can Portland support you and/or your community? I think tokenization is so prevalent in Portland that people who are ashamed to care about people of color use tokenization as a cloak to deflect their own racism. With this it ensures that white supremacy can go on, but with brown face. What’s painful is the model minority myth that erases Southeast asians and South asians who are often poor immigrants & refugees. We exist too within the Asian American identity, outside of food and tourism, and we need care for our communities— for mental health and PTSD. What Portland can do is give financial support. For intellectual, creative, and emotional labor. Portland can fund social and cultural initiatives put on by people of color: galleries, music shows, talks, panels, healing spaces. There is no talent shortage… trust me. Also, pay people of color for their appearances on your interviews, panels, promos, or diversity posters. If I ever gave you any a-ha moments, my Venmo & Squarecash is maycatpdx. 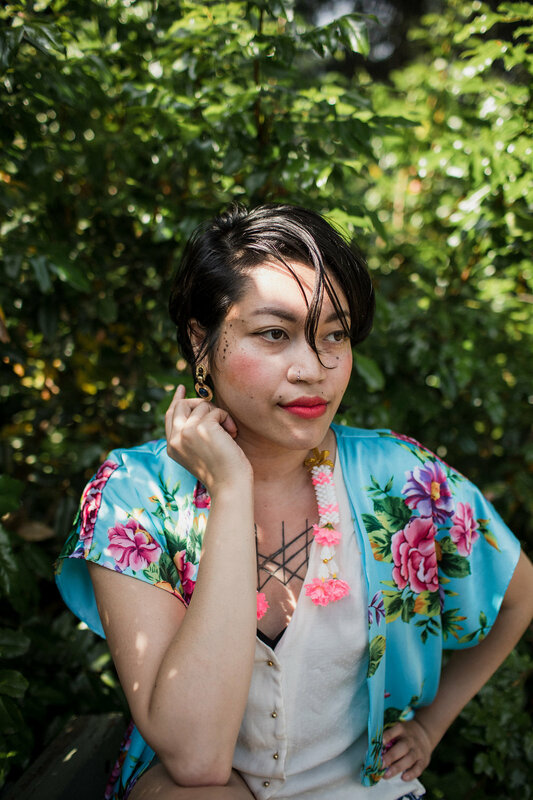 May is also an organizer for Men's Assembly For Collective Accountability and the Southeast Asian Cultural Festival, New Year in the Park. Read her piece 7 Things Your Thai Friends are Sick of Hearing and follow her work on maycatpdx.com and kinkhaothaidiaspora.tumblr.com. Find value in what you've read? Donate to Portland in Color to keep the series going.